This June 1, 1968 file photo shows the silo fire at Dairyland in Reedsville where three junior firefighters were killed from an explosion. 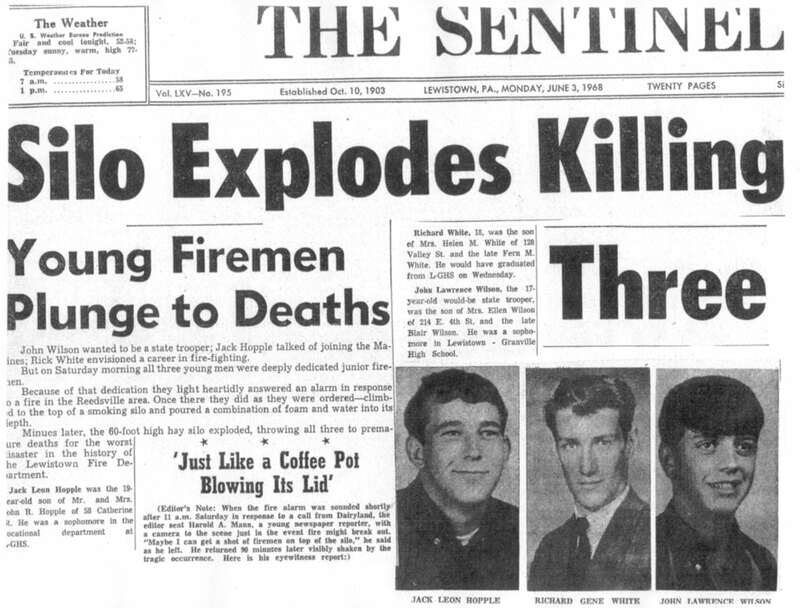 The headlines on June 3, 1968 were grim after three junior firefighters were killed due to a silo explosion in Reedsville. 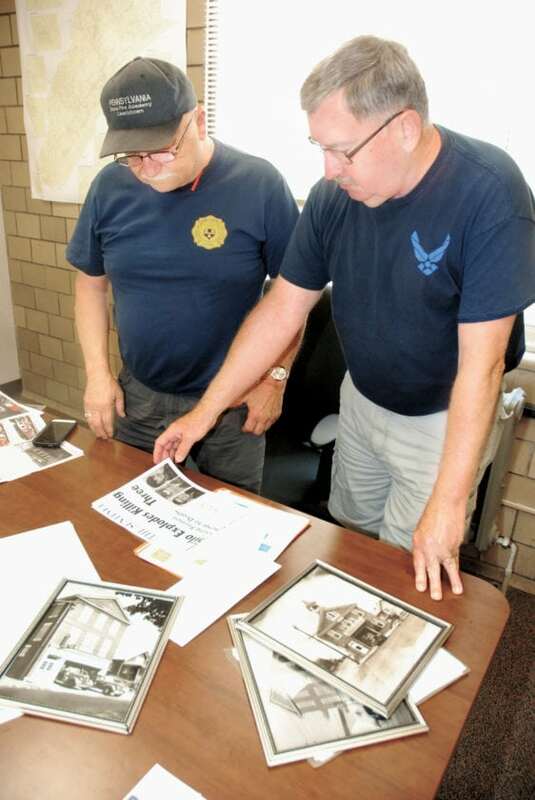 Bob Barlett, left, department chief of Lewistown Fire Department, and Sam Markley, a 51 year member of the LFD, look over a Sentinel article from 1968 about three junior firefighters from LFD killed in the line of duty. REEDSVILLE –June 1, 1968, described as a “picture perfect spring morning, not a cloud in the sky” by Sam Markley, a junior firefighter with City Hook and Ladder at the time and who is still active in the Lewistown Fire Department, said about the Saturday morning 50 years ago. The Reedsville Fire Company was responding to a silo fire that had been lingering for several days at Dairyland, a combination diary farm and retail outlet for dairy products located near the Reedsville exit of state Route 322. It was also noted the firemen, who are usually very busy at fires, were participating in friendly banter and some were watching a calf being born at the farm. The crowd followed the trucks and watched as a tiny wisp of smoke from top of one of the silos caused little fear. Markley explained the air-tight type of silo was relatively new in 1968, so no one knew exactly how to fight the fire. Reedsville tried to unload the silage from the silo, but the conveyor burned up in the process. So the idea was born to fill the silo with foam to smother the fire. Chief Larry Yohn, from Reedsville, called Chief Kenneth Powell, of the Lewistown Fire Department, to ask for help. Powell sent Fame and Henderson because Fame had the generator, and Henderson to carry the foam, and he also sent City with its ladder truck to access the top of the silo. Once there, Yohn and three junior firefighters from the Lewistown Fire Department — Jack Hopple, Richard White and John Wilson — who, according to a Sentinel article in 1968, were fully trained as volunteer firemen, did as they were ordered and climbed to the top of a smoking silo and poured a combination of foam and water into its depth. At the top, the generator was turned on to blow the foam into the silo. After several minutes, the sound of a “gigantic pressure cooker exploding or a coffee pot blowing its lid from pressure” was heard, according to the article. “This gave the fire the oxygen it needed and it blew the top off the silo,” Markley said. According to the article, the 60-foot high hay silo exploded, throwing all three to premature deaths, ending in the worst disaster in the history of the Lewistown Fire Department. Yohn survived the explosion, but was seriously injured. According to the article, 13 other volunteers were reportedly injured or treated for shock at the hospital. The days after the explosion were difficult times for area fire companies, schools and the community. Three separate funerals were held with fire departments participating in a limited way. “It was a difficult time and it was compounded by Jack being buried on his graduation day,” Markley said. Hopple was 19 years old, White was 18 years old and Wilson was 17 years old, at the time of the explosion. Markley said members of the fire companies coped with the loss by just talking amongst themselves at the fire houses. 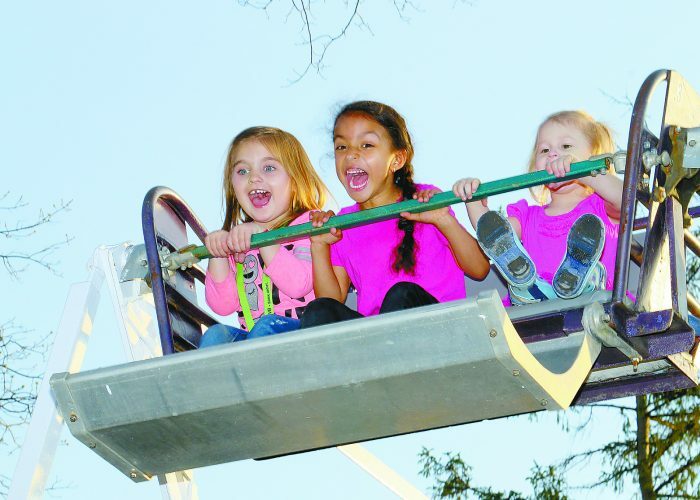 “We banded around and tried to keep each other cheered up,” Markley said. Bob Barlett, department chief for Lewistown Fire Department, hopes remembering these three young men will remind the members in the fire department how quickly things can happen. Prior to the silo fire, the Lewistown Fire Department had three line of duty deaths. Lester R. Sankey died on March 31, 1947; John Thomas Blewett died on May 2, 1962; and Charles A. Price died on Oct. 29, 1964. Despite the tragedy, the one good thing that came out of it were the many studies done by universities about how to safely handle hazmat situations with gases. Barlett said many other people’s lives have been saved because of this incident, and now no one goes to the top of silos anymore because gases can be purged from a pipe now. 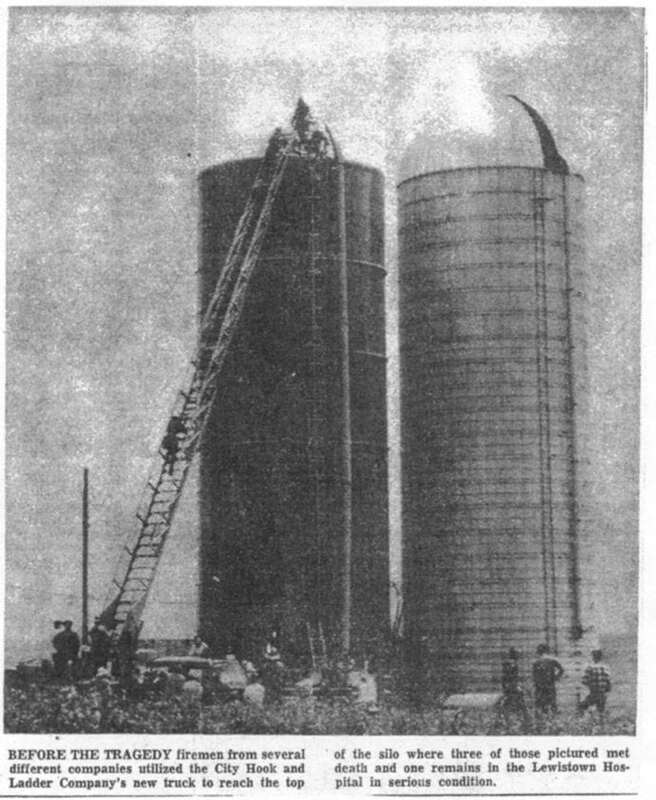 With today’s child labor laws, the junior firefighters would not be allowed to climb to the top of the silo. Markley also explained in 1968, fire companies were comprised of many junior firefighters due to the Vietnam War, and many older firefighters were drafted into the war. Both men have learned to not take anything for granted from this incident and others. “There is no such thing as a routine call,” Markley said. “You think you’ve seen it all when something new comes up,” Barlett said.